Adam Bartoshesky Photos, News, and Videos | Just Jared Jr.
Eva Gutowski shines in an almost identical dress she wore earlier this week at the Michael Jackson Diamond Birthday Celebration held at Mandalay Bay Resort on Wednesday night (August 29) in Las Vegas. The 25-year-old digital influencer stole a kiss from boyfriend Adam Bartoshesky on the black carpet at the event. If you missed it, Eva revealed that her car was totalled by someone who was texting and driving. “I am calm. This will all be fine and it’s just a life experience. But the woman that hit me is in the hospital now. Let this be a lesson to stop using your phone on the road,” she wrote. Eva Gutowski had one heck of a day yesterday. Just before walking the black carpet with longtime boyfriend Adam Bartoshesky at Variety’s 2018 Power of Young Hollywood on Tuesday night (August 28) in West Hollywood, Calif., the digital creator’s parked car was totalled by someone who was texting and driving! Eva explained the entire story on her social media. “Well…Three months ago I was hit on the freeway by someone texting and driving. It took three months for my car to be fixed and I JUST got it back last week. Today, another distracted driver did this,” she wrote with a pic of her car. Tyler Oakley, Jenn Im, Tessa Brooks, Jordyn Jones and Amanda Steele are also pictured below. Eva Gutowski Dyes Adam Bartoshesky's Hair Blonde & Gets Her First Tattoo! 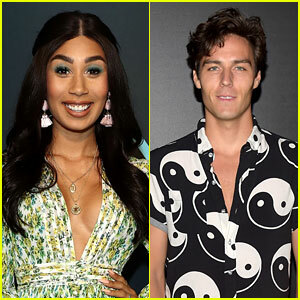 Eva Gutowski and Adam Bartoshesky made some changes to their appearances this week! The influencers – who appear to be back on again as a couple – both took to social media on Friday (May 25) to share their new looks with fans. Is Eva Gutowski Back With Adam Bartoshesky? Looks Like It! Eva Gutowski and Adam Bartoshesky might be back together after reuniting at Coachella over the weekend in Indio, Calif. The two shared a few pics, shot by Riley Taylor, on their Instagrams of them kissing at the festival. While neither have clearly stated that they are back on as a couple, it definitely looks that way. “We’re better together,” Adam captioned the pics he shared, while Eva just posted an emoji with hers. Just a few weeks ago, Eva opened up about splitting up with Adam and why they did so earlier in the year in a vlog. Watch that on JJJ here. Eva Gutoswki shares a sweet kiss with boyfriend Adam Bartoshesky on the pink carpet at the PrettyLittleThing x Olivia Culpo Launch Party in Los Angeles on Thursday night (August 17). The longtime couple and social stars hit up the fashion event with model/designer Olivia Culpo and Shannara Chronicles‘ star Ivana Baquero. After the party, Eva shared a “free” everything photo and shared it with her fans — and it’s gorgeous! “No extensions, no makeup, no straightener. Still cute,” she wrote. That’s right Eva! Eva Gutowski Just Threw The Best Book Launch/Valentine's Day Party Ever! 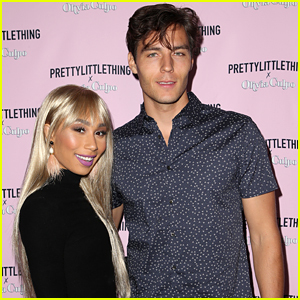 Eva Gutowski‘s book launch event brought out all of your favorite social stars! The author, actress and YouTuber hosted a big party for the debut of her new book, “My Life as Eva: The Struggle is Real” last night in Hollywood. Chloe Couture, Austin and Aaron Rhodes, Aidan Alexander, Christian Collins, twins Gabi and Niki DeMartino, plus Skai Jackson also came to celebrate. FYI: Skai wore a Stylenanda jacket and Basquait skirt.